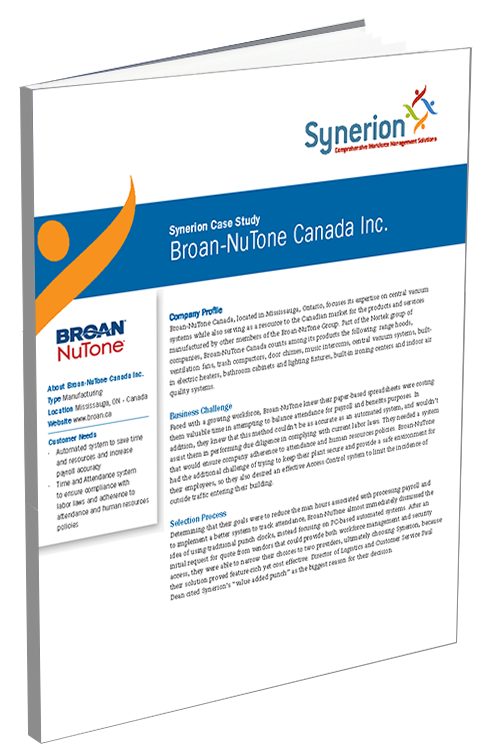 Free Case Study: Broan-NuTone Canada Inc.
Broan-Nutone is America’s leading brand of residential ventilation products including range hoods, ventilation fans and heater/fan/light combination units. Learn about their story of using paper-based spreadsheets when attempting to balance attendance for payroll and how they were able to save valuable time and money through automation. By downloading this content you are consenting to receive email communication from Synerion regarding our services and other educational information we offer. You may unsubscribe at any time.